It really is true that you need a mailing list in order to succeed online over the long term. You can learn more about list building in my List Building Quick Course. But having a list is only part of the story. It’s what you do with the list that really matters. The real earning power of having a list is is the relationship you have with the people on your list. The products you choose to promote, and when you promote them. The information you provide and how you respond. Well today I’m going to talk about it. Today I’m going to share the rest of the story. Here’s a question for you. If I gave you a list of 50,000 real people and told you that this was now your mailing list so you could do anything you wanted with it … what would you do? How would you go about creating sales from that list? What would you say first, second, third? How often would you email them and what would you promote? You see, the answers to these questions are far more important than the sheer number of the list. I have a friend who has a list of 80,000 people but makes only a little money from that list. Why? Because he pounds them with offer after offer day after day. If there is a product launch or JV happening online, he’s mailing to his list about it. It’s sad really because those people did not join his list to be pitched continuously. They joined because they have a need – and it’s not a need to buy things! Whether you have a list of 500 or 500,000 (or even if you are just starting) here is a formula you can follow that will help you serve the people on your list and make sales at the same time. It all starts with what I call my TRUST formula. I named this method TRUST for one very important reason. Without trust your list will never respond the way you want them too. Period – end of story. Here’s how it works in the real world. People need to get to know you before they can like you. They need to like you before they can trust you. 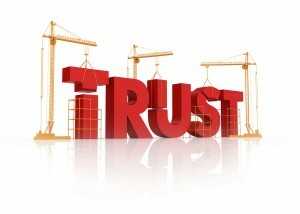 And when they trust you – when you have earned that trust — some very good things can happen. Does it take work? Yes. Is it worth it? Building a list and gaining the trust of the people on your list is THE key to experiencing freedom. So really, only you can say if it’s worth the effort. Personally, I would never do business any other way. So here’s the formula in a nutshell. Take a look and then we can dig in to each letter to learn more. Many people are worried about the “teaching” part of this formula because they do not consider themselves to be expert enough to teach because they have not yet experienced success. I have a friend named Buck who can tell you everything you ever wanted to know about the Civil War. But he didn’t live through the civil war. Yet he is considered an expert on the Civil War. You see, you don’t have to be THE expert to teach. But you do need to teach from a place of either experience or investigation. Do you remember a couple of guys called Siskel and Ebert? They were movie reviews on television for a while (I think Ebert is still at it) and were very funny in how they did their reviews. They could barely agree on anything! In their day their “thumbs up or down” could help or hurt ticket sales … a lot. But I don’t believe either of them ever made a movie. I doubt they ever acted or directed or wrote a movie. But their deep research earned them — you guess it — trust. The moral of the story is this; don’t wait until you know everything there is about a thing to begin sharing what you DO know. But don’t write about things you know nothing about either. If you strike that balance and your motives are to help readers you will do very well indeed. A vital, and often overlooked part, of developing a trust relationship with the people on your mailing list is rewarding their continued readership. In today’s world the person who joins your list, stays on your list and consistently opens and reads your messages should be considered not only a “business asset” but a friend. If you communicate with your list in this way you will do well. Care about the people on your list. Do your best to help them. And, by all means, reward them with occassional suprises along the way. You don’t have to be rich to do this. You have PLR products sitting on your hard drive right now that very well could be a blessing to those on your list. You are exposed to effective and fun strategies every week as you read email and use the products you buy. Sharing these (with permission of course) are but two ways to reward the people on your list. PERSONAL NOTE: If you want to really build trust, and if this is in your heart to do, give the people on your list something of real value and from which you can’t possibly profit. They will see your sincerity and reward it when the time comes for you to make a specific buying recommendation. The next step is to uncover the needs of those on your list. But how can you do that? I know it sounds simple, and it is, but it works. Again, you need pure motives here. We’ve all seen the “Tell me what you need” messages from marketers where they do a survey and then build a product that just “happens” to fit what the survey says. That’s just a marketing tactic, what I’m talking about is something more. I’m talking about really knowing what your audience needs. How can you do that? Here are three ideas. I. Read the comments on your blog and look for pattterns. 2. Ask your list what they need with no ulterior motive. 3. Set up a “reply” email for your list so people can hit “reply” and ask a question. If you do nothing more than these three things you will know more about the people on your list who go to great lengths in order to avoid all contact with the people on their list. You know the type – they use “do not reply” addresses and all sorts of filters to avoid you. This goes back to the age-old discussion about features vs. benefits. If you want to know more about that I have an article you can read here. Now that you know what your list members need you can scout around and find the right solution and then offer it to them. The key here is to make a recommendation based on experience and your own research and not just on what’s “hot” or being launched today. Rememer my friend with the big list I talked about earlier? He’s the guy you don’t want to be — the person who promotes every product that comes out as if it is the solution to YOUR problem when he doesn’t even know your name. Selling solutions is the name of the game. Sell what the product will do for the buyer, not just what the product can do. I’m buying a new car and the last salesman I spoke with was so excited that his car would go from 0 to 60 in 4.3 seconds. What he did not realize is that I would never in my life want to do that. Rather than trying to uncover my needs he was totally focused on selling what he wanted me to buy. Now that you’ve done the hard work of gaining trust it’s time to make suggestions of what your readers might buy that will help them. Here are a few suggestions of how to do that based on my own experience. 1. Only promote what you know works and you do yourself. 2. Get very specific about why you are making a recommendation to take action. 3. Tell your reader the specific action you want them to take. Not all actions involve buying something. You might want them to subscribe to a new list or download a free trial. In all the years I’ve worked online the thing I have done that has been the most profitable is not building a list. In truth, I have a rather small mailling list when compared with other marketers. The most profitable, and rewarding, thing I have done online is getting to know the people on my list, serving them and having them reward me again and again when I make suggestions. If you are one of them, and I suspect you are, thank you. I consider you not only a subscriber but a friend. And friendship is perhaps the most beautiful thing indeed!